I am learning so much as I try EFL principles in my classroom. Using the “Personal Excellence” qualities translates well into the public school environment. I continue to use this as my central theme. As the students explore what it means to be at their highest it can be very exciting. Just how high can one go? What is one’s personal best? To try and be at one’s best and keep one’s heart open is very hard to do in a public middle school but it can be full of rewards. I can see that some students are starting to try as we deal with some deep topics. 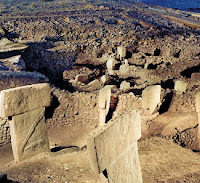 For example, in social studies we have been studying archaeology in our textbook and the students watched a couple of short youtube videos about what it means to be an archaeologist. They pondered how we know what we know and how the different theories of early man continue to be pieced together. The students wrote about the “Personal Excellence” qualities one needs in order to be a successful archaeologist and why. They came up with a list that included curiosity, perseverance, cooperation, patience, clear thinking, etc. We talked about how all these are needed to decipher the past as different artifacts and evidence is constantly being discovered and reinterpreted. We noted how people try to make sense of places like Catal Huyuk (in our textbook) and Gobekli Tepe (c. 9500 BC see web site http://www.smithsonianmag.com/history-archaeology/gobekli-tepe.html) which are both in present day Turkey that do not fit the mold of hunter-gatherer theories. All month I have been looking for a way for students to experience archaeology by doing some activities that they could enjoy and that would encompass all the Tools of Maturity: physical, feeling, will, and intellect. To me that means not just books, paper, and pencil but going from academic desk work to direct experience. As we finished our unit on early man and the theories of hunter-gatherer societies that lived 200,000 years ago or more, one of my small Asian girl students surprised me by showing me a small spear she had made at home on her own initiative. She must have read my mind because I had always secretly wanted to have the students make their own stone age tools and make a “pretend” archaeological site. I saw this as a sign that indeed I better get a move on before we finished the unit. The students were given a week to come up with a stone age artifact made at home from natural materials or found in nature but used by the early people. We had made a chart in school of the different parts that make up any given culture and talked about the different tools that the early peoples had needed for their society. Also, we finished reading the novel based on that society, Maroo of the Winter Caves, (required reading in 6th grade at our school). Once the whole class had brought in their homemade artifacts and found objects, we borrowed some land from our school garden and I had the morning class bury their artifacts and objects for the afternoon class to dig up and vis a versa. (See photo, unfortunately, I can not show students because of the complications of getting parent permission). One interesting learning moment came up when a student shared his confusion at not being able to find any materials in his home to make a stone age tool. The class helped him realize that he had to actually go outside, out in nature to get his materials because the early people only lived in nature. That was an aha! moment as he was able to perceive a view point outside his own modern world of remote controls, ipods, cell phones - which is his reality. After the dig, as we sat around in a circle surveying our find we discussed the difference between our pretend excavation and real life artifacts that would have still survived after thousands of years. The students realized that probably only the stone objects would have survived disintegration. We looked at the abundance of hunting tools. There were many spears, sharp rocks or choppers, bows and arrows. But some students had brought in different items. A smooth rock with picture symbols carved into it, shell necklaces, a decorated rattle. One student made a woven basket from palm fronds in her yard. There were also pretty shells with no known purpose. I had also snuck in and buried a softball size open amethyst rock or geode when they weren’t looking. One student surmised that the pretty shell might have been used as an offering to the nature gods. As we looked at the objects that were excavated we discussed the natural environment of early man. 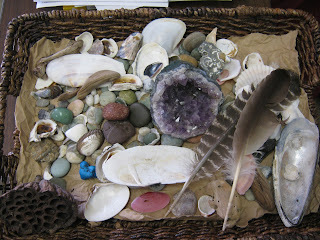 I brought in many of the nature object that I’ve collected and used them for a quiet meditative activity. I turned off the lights, had them close their eyes, and I put one of the nature objects I brought like a shell, rock, driftwood, feather in each of their hands. In silence, they had to feel the object, and try and picture it in their mind’s eye. Of course, they had to guess what it was, what color, and where I had found it. They were thoroughly intrigued by the difference between their perception and the reality of the object. As an on going activity for the rest of the year, I asked them to bring in something beautiful from our natural world to add to our tray of nature objects that I started. As they go out in nature they will bring something back and share their connection with our natural world. So inspiring Liz. Thank you for sharing and thank you for bringing EFL to those kids! This is very impressive and is a great example of how students are inspired and motivated by activities that tap into their creativity and imagination. Thank you for sharing your experience and the photos. I look forward to reading more.